At least 4 Hula Hoops. Have each student find a partner and stand with their partner. Have the students decide between them who is partner 1 and who is partner 2. Bring all of the partner 1s to the middle of the gym, and have them hold hands and back up to make the largest circle they can without letting their hands come apart. Then, have the students let go of their hands and have all the partner 1s take 3 large steps backwards. Now, have the partner 2s come and link arms with their partner 1. Place four hula hoops in the middle of the gym (as shown in the picture). If the teacher shouts “partner 1,” all of the partner 1s must run around, and outside of, all of the partner 2s in a clockwise direction until they make it back to their own partner. 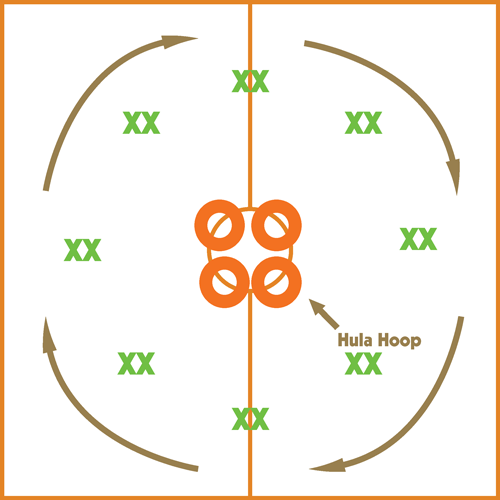 When partner 1 makes it back to his/her partner, they must crawl through the open legs of their partner and try to get inside one of the four hula hoops. The first four people to get both feet inside one of the four hula hoops win a point for their team. The first team to five points wins the game. Remind students that they must be very careful when running towards a hula hoop, as their could be more than one student heading towards a hula hoop at the same time. 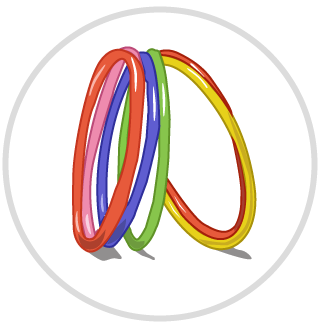 At the end of each game, have the students switch partners and/or add or take away hula hoops to change the difficulty level.